While many people have a game plan for “saving and investing” money (it’s called the “accumulation phase” of life), those same folks do not have a game plan for “using and enjoying” it (the “spending phase”). It can happen to any of us: we work and worry ourselves sick about stockpiling more and more hay, and for what? To leave it to someone who’ll probably blow it? There’s nothing wrong with stockpiling money for the future, unless it takes control of our lives and zaps our joy in the process. Moral to the story: at some point, you either decide to spend it on yourselves and those whom you care about (family and charity) or let others spend it for you (the government, Wall Street, banks, favorite attorney, relatives you never really cared for, nursing home, etc.). So what’s your goal when it comes to using and enjoying your money? Depending on your age, there are two financial products that much of the herd doesn’t follow, but upon learning the truth, can help you certainly gain more control over your money. 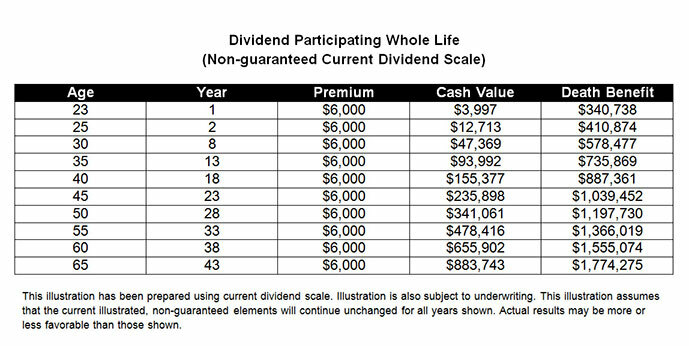 Dividend Participating Whole Life (DPWL), or Whole Life as it is more commonly referred to, is one of the few (if not only) financial products that provides both tax-free access to cash (for anything we want) during our lifetime and a barn full of tax-free, cold hard cash for our loved ones when we kick the bucket. While this product is for all ages, it works very well for young folks. When our college graduate reaches age 65, based on current dividends, his cash value (that’s the money that’s available to him during his lifetime) is $883,743 while the death benefit (the amount of tax-free cash that goes to his loved ones when he kicks the bucket) is $1,774,275. Plus, through a special rider called “waiver of premium for disability,” should our college graduate become totally disabled, the insurance company will continue to pay the $500 a month (for as long as he remains disabled). Here’s another safe idea for using and enjoying more of your money that’s very appropriate for folks at or near retirement: the Split Annuity. 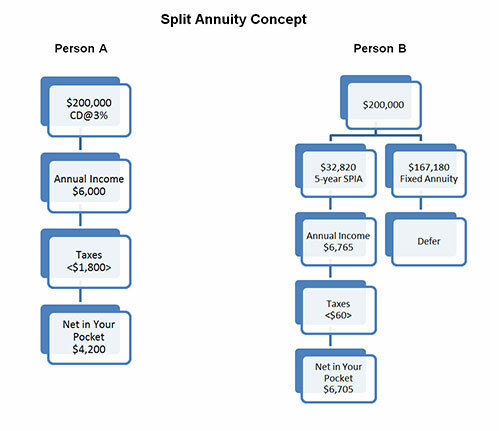 Person A is a typical retiree who has $200,000 in a CD currently earning 3%. His or her main objective is to protect principal and live off the interest. This was a good strategy when CDs were paying 5% or 6%, but 3%? Notice the retiree in the CD strategy receives $6,000 per year. However, Uncle Sam gets to take his fair share in taxes from the $6,000 (here’s where paying taxes on the same dollar more than once comes into play). So let’s say this person is in a 30% tax bracket; the IRS takes $1,800 (30% of $6,000). This leaves person A with a “net” annual income of only $4,200. With the split annuity, the annual income is $6,765 a year. Plus, based on a favorable provision in the tax law (called an exclusion ratio) our retiree only pays taxes on $202, providing a higher net annual income of $2,505. But you may ask, “Isn’t Person A draining one of the buckets down to nothing?” Great question… The first bucket under the Split Annuity strategy pays our more money (principal plus interest) so that the retiree can safely use and enjoy more money (which is the whole point). When the first bucket is completely empty, we simply move over and tap into the second bucket, which during the period of time that the first bucket is being drained, has all grown “tax-deferred” (no taxes during accumulation). So with the Split Annuity, you get more income, pay less taxes and get “sleep insurance,” all in one. As always, be sure to talk to your financial advisor about Whole Life and the Split Annuity concept to see which choice is best for you in your situation and if they’re viable options for your portfolio. You’ll be glad you did… and will most likely worry less about your retirement as a result.